2017-18 Donruss Rookie Jerseys MARKELLE FULTZ. 2016-17 PANINI GOLD STANDARD BASKETBALL TYLER ULIS. 2016-17 Gold Standard Basketball Tyler Ulis Suns. Numbered to only #25. Above pictures are actual card you are purchasing. Brice Johnson Clippers RPA Rookie Patch Auto 16/35. 2016-17 PANINI NOIR BASKETBALL BRICE JOHNSON. CLIPPERS ROOKIE PATCH AUTO CARD 16/35. 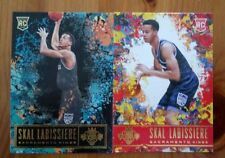 2016-17 Panini Noir Basketball. Numbered to only #35. Above pictures are actual card you are purchasing. 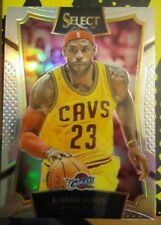 Lot includes stars and rookie insert cards of Kobe Bryant, Ray Allen, Stephon Marbury, Antoine Walker, Marcus Camby, etc., from desirable subsets like. Player Kobe Bryant. Series Rookies. Product Single. Grade Ungraded. Season 1996-97. Card Number #3. EFFECTIVE April 19, 2014. 2015-16 Panini Spectra Spectacular Swatches Autographs Blue Prizms #SSZL Zach LaVine - Serial Numbered 135/149. Player Zach LaVine. Series Spectra. Card Attributes Piece of Authentic. Original/Reprint Original. Professional Grader Beckett (BGS). Player Magic Johnson. Series Exquisite Collection. Card Attributes Short Print (SP). Card Attributes Piece of Authentic. Product Single. Card shown in image is the actual card you will get. 2015-16 Panini Spectra Spectacular Swatches Autographs Blue Prizms #SSNENE Nene Hilario - Serial Numbered 035/149. Player Nene Hilario. Autograph Authentication Panini. Card Manufacturer Panini. Series Spectra. Team Toronto Raptors. 2016-17 Panini Spectra Locked In Autograph Materials Prizms #44 Norman Powell - Rookie Card - Serial Numbered 163/199. Player Norman Powell. Autograph Authentication Panini. Card Manufacturer Panini. 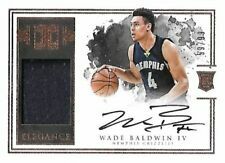 2017-18 Panini Spectra #124 Wes Iwundu JSY AU - Rookie Card - Serial Numbered 140/299. Player Wesley Iwundu. Autograph Authentication Panini. Card Manufacturer Panini. Series Spectra. Card Attributes Rookie. Player Kawhi Leonard. Series Exquisite Collection. Card Manufacturer Upper Deck. Card Attributes Rookie. Product Single. Card Attributes Single-Parallel. Card Attributes Single-Insert. Card Attributes Short Print (SP). Player Kobe Bryant. Series Exquisite Collection. Card Manufacturer Upper Deck. Season 2003. Card Attributes Short Print (SP). Product Single. Card shown in image is the actual card you will get. Certification Number 27886279. 2016-17 Panini Spectra Spectacular Swatches Autographs Neon Blue Prizms #SSDBY DeAndre' Bembry - Rookie Card - Serial Numbered 91/99. Player DeAndre' Bembry. Team Saint Joseph's Hawks. Series Spectra. Professional Grader Beckett (BGS). Series Exquisite Collection. Card Attributes Autograph. Autograph Authentication Beckett. Autograph Format Hard Signed. Card Attributes Short Print (SP). Product Single. Card Manufacturer Upper Deck. Era Modern (1970-Now). Larger Sets-Vary by weight. UPC Does not apply. Card Attributes Single-Insert. Season 2009-10. Product Single. League NBA. Professional Grader Beckett (BGS). Card Attributes Short Print (SP). Certification Number 004516044. Card Attributes Single-Insert. League NBA. Card Attributes Serial Numbered. Card Attributes Piece of Authentic. Player Hakeem Olajuwon. Series E-X Century Essential Credentials. Professional Grader Beckett (BGS). Certification Number 0008243446. Era Modern (1970-Now). Season 1998-99. Product Single. Autograph Format Cut. Card Manufacturer Upper Deck. Card Number #8. Season 2003-04. Product Single. League NBA. Shane's Sports Cards. Kevin Durant (Oklahoma City Thunder). Condition: BGS 8.5 NM-MT . Player Kevin Durant. Professional Grader Beckett (BGS). Series National Treasures. Product Single. Autograph 10. Era Modern (1970-Now). 2018-19 Panini Prizm Sensational Signatures #SSSVI Svi Mykhailiuk - Rookie Card. Player Svi Mykhailiuk. Team Los Angeles Lakers. Autograph Authentication Panini. 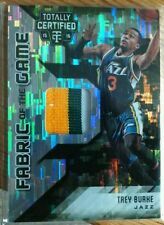 Series Prizm Basketball. Card Manufacturer Panini. It can’t be seen from the front. I’m assuming it was an error during Printing. Everything else looks pristine. Professional Grader Beckett (BGS). Series Exquisite Collection. Autograph Authentication Upper Deck. Card Attributes Short Print (SP). Product Single. Card Attributes Piece of Authentic. Certification Number 0010435598. 2015-16 Panini Spectra Spectacular Swatches Autographs Blue Prizms #SSTJW T.J. Warren - Serial Numbered 069/149. Player T.J. Warren. Series Spectra. Card Attributes Piece of Authentic. Card Number #1. Series Spectra. League NBA. Autograph Authentication Panini. Card Attributes Autograph. Autograph Format Hard Signed. Card Attributes Piece of Authentic. Card Attributes Short Print (SP). Card Attributes Serial Numbered. Player Ben Simmons. Series Panini Immaculate Collection. Product Single. Autograph Format Cut. Card shown in image is the actual card you will get. Original/Reprint Original. Team Philadelphia 76ers. Card Attributes Single-Insert. 2017-18 Panini Spectra Rising Stars Signatures Neon Blue Prizms #RSDJW D.J. 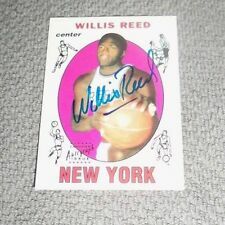 Wilson - Rookie Card - Serial Numbered 07/49. Series Spectra. Player D.J. Wilson. Card Number #23. Card Thickness 75 Point. Original/Reprint Original. Card Manufacturer UPPER DECK. NRMINT/MINT CONDITION. Wesley Johnson 2012-13 Totally Certified TOTALLY BLUE SIGNATURES Autograph Insert Card (#'d 09/15). LOOK THROUGH 100'S OF LOW END BARGAINS. This card is in Mint to Near Mint condition.